I am going to start by sharing the last session of 2017! I was in the midst of my much-awaited Christmas break when a long-time client reached out to me with a last minute request. She just had a baby girl and decided she wanted a session! I had photographed her 1st baby, a boy, and then had him back in the studio for milestone photos, and she is one of my really favorite clients (some people you just really like, right?!) so I couldn’t say “no”. I scrambled to find a date that worked between Christmas and the New Year, and was so happy to see her and her sweet toddler and to meet their new addition for her newborn session. I think I got some really wonderful shots of this sweet little lady while her mommy and big brother got to have some quiet time – just the two of them – hanging out and playing quietly while I worked my magic. We did some prop shots on the bed, in a bowl with flowers, and in a rustic wood crate with a teddy bear stuffie – love how they turned out, the bowl shot with flowers is my favorite! 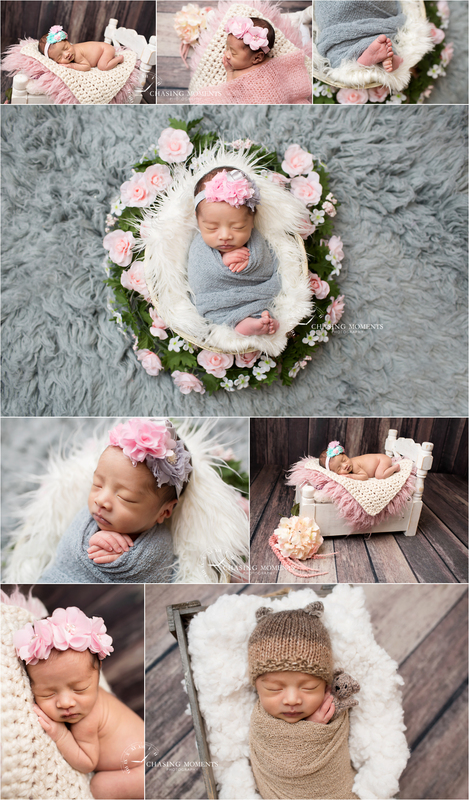 I also did some posed shots using a gray-pink color scheme, as suggested by Mommy, and couldn’t be happier with how everything turned out! With a combination some classic side-lying and tummy-lying poses, wrapped shots and portraits, the overall session really came together nicely. Finally, some teddy bear magic! 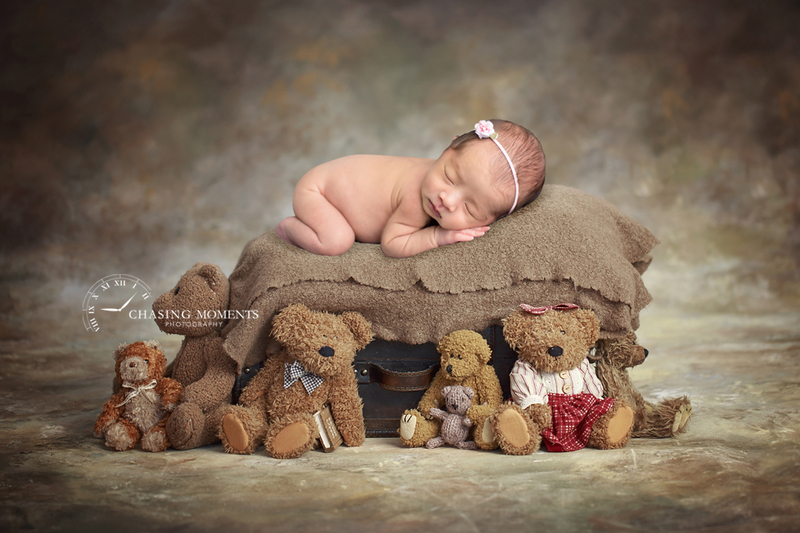 We did a teddy bear set up with her big brother, and I just had to have a teddy bear shot in the gallery for this little lady’s newborn photos! If you like my newborn photography work, if you need beautiful photos of your newborn and if you are expecting in 2018 please email me at chasingmoments@gmail.com or call me (202) 251-6368 to schedule your newborn session. I am now booking clients with due dates into summer of 2018!